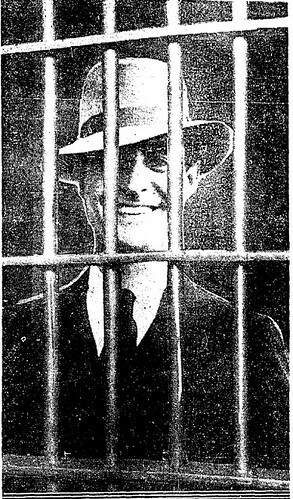 John Gilbert, celebrated film star and sometimes paramour of Greta Garbo entered lock-up today with a sheepish grin on his face. Gilbert was arrested for disturbing the peace early on April 11 when he appeared at the Beverly Hill Police Station after a party at his home, demanding that someone be arrested. Who exactly, he wouldn’t say. When police explained they could not make an arrest without a name, Gilbert became so boisterous that he was jailed until morning. "I must have been laboring under a hallucination and looking for trouble," Gilbert said of his behavior. "I wasn’t angry at any of my guests and I just went down to the station and the boys took care of me; very kind to me." Gilbert was sentenced to 10 days in jail, which he said, "ought to be a nice, quiet vacation." Could there have been trouble with Mauritz Stiller, Gilbert’s main rival for Garbo’s attentions? Too much sauce? Or just a celeb behaving badly? It’s anyone’s guess – Gilbert kept mum on the cause of his outburst.